The Developing Core Literacy Proficiencies program is an integrated set of English Language Arts/Literacy units spanning grades 6-12 that provide student-centered instruction on a set of literacy proficiencies at the heart of the Common Core State Standards (CCSS). The program approaches literacy through the development of knowledge, literacy skills, and academic habits. Throughout the activities, students develop their literacy along these three paths in an integrated, engaging, and empowering way. Knowledge: The texts and topics students encounter in the program have been carefully selected to expose them to rich and varied ideas and perspectives of cultural significance. These texts not only equip students with key ideas for participating knowledgeably in the important discussions of our time, but also contain the complexity of expression necessary for developing college- and career-ready literacy skills. 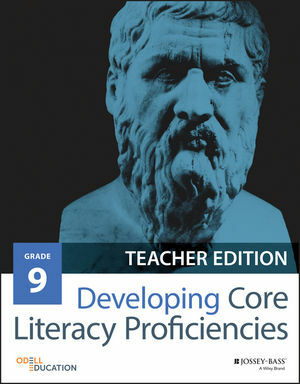 Literacy Skills: The program articulates and targets instruction and assessment on twenty CCSS-aligned literacy skills ranging from “making inferences” to “reflecting critically.” Students focus on this set of twenty skills throughout the year and program, continually applying them in new and more sophisticated ways. Academic Habits: The program articulates twelve academic habits for students to develop, apply, and extend as they progress through the sequence of instruction. Instructional notes allow teachers to introduce and discuss academic habits such as “preparing” and “completing tasks” that are essential to students’ success in the classroom. The program materials include a comprehensive set of instructional sequences, teacher notes, handouts, assessments, rubrics, and graphic organizers designed to support students with a diversity of educational experiences and needs. The integrated assessment system, centered around the literacy skills and academic habits, allows for the coherent evaluation of student literacy development over the course of the year and vertically across all grade levels. ODELL EDUCATION (OE) is dedicated to fostering creativity and critical thinking in students and the education community. OE has developed nationally validated and acclaimed literacy curricula and collaborates with schools, states and organizations on assessment design, curriculum development, and teacher training. All materials from the Literacy Toolbox are available as editable and printable PDFs at www.wiley .com/go/coreliteracy. Use the following password: odell2016.